Join us visiting Ras Mohammed National Park. Enjoy its beauty, its landscape and its wildlife. Enjoy real non-limit-diving at one of the most beautiful dive sites on this planet. Our guests can dive either next to the camp or at the Ras Mohammed dive sites. You can reach all the Ras Mohammed divesites by jeep in less than 15 minutes. 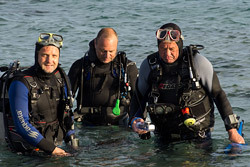 Our diveguides will help you to find the most beautiful dive sites with easy entry. Diver's Camp Ras Mohammed means full board and lodging. Not included are bottled water, softdrinks and alcoholics.